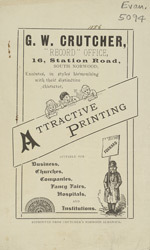 This is a leaflet advertising the services of G. W. Crucher, a printer. The application of new printing technologies from the 1840s encouraged the publication of books, newspapers and comics, as well as posters, handbills and leaflets. There was an explosion in advertising mediums at this point, posters were pasted on every available hoarding, men wearing sandwich boards walked the streets and leaflets were distributed on every corner.